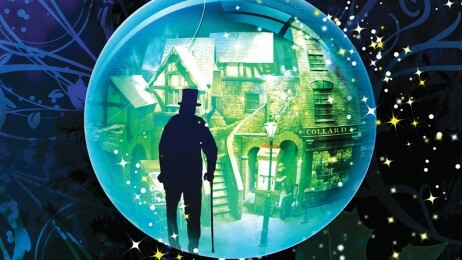 Birmingham Rep’s Christmas production this year is A Christmas Carol, and you couldn’t ask for anything more festive. I went to see it on the 1st of December and found it a great way to get in the festive spirit. Starring Peter Polycarpou as a delightfully grumpy, miserly and bah-humbug Scrooge, it tells Dickens’s tale in a way that is entertaining and can’t fail to raise a smile, appealing to both children and adults. It’s a musical version, with a number of songs and even a little dancing, and of course it’s slightly cheesy, but then, what Christmas show isn’t? What makes it less cheesy, and more unusual, is the interesting idea of introducing a wide range of ghosts who are watching Scrooge, and decide to teach him a lesson. While this isn’t in the book, it does give a dramatic edge to the production that makes it quite spine-chilling at times, and reinforces that most Victorian moral message, that we should behave towards others as we would wish them to behave towards us – especially at Christmas. The set is amazing – bleak at one moment and richly festive the next, with changes appearing to happen by magic, often wreathed in atmospheric smoke. The whole production is cleverly done, and one would really have to be a Scrooge to fail to enjoy it.